​Napoli president Aurelio De Laurentiis is looking at options to finance the building of a new stadium away from the Stadio San Paolo, with a new McDonald's backed venue a possibility according to one report. The condition of Napoli's current home has been a bone of contention with the outspoken De Laurentiis in recent times, with the club president labelling the 70-year-old arena a 'cesspool' despite a recent renovation project. ​Napoli have struggled to fill the 55,000-seater San Paolo recently, while building a new venue with the help of private investors is something De Laurentiis has been particularly vocal about. Earlier in the week De Laurentiis even claimed he asked UEFA to authorise Champions League fixtures at alternative locations this season - ​something which UEFA have since denied. ​Cronache di Napoli claim that McDonald's have approached the club about a new stadium and could be prepared to finance its construction in exchange for naming rights - with the proposed name of the stadium the McDonald's Arena. While Juventus have successfully downsized to a smaller, more modern stadium - with naming rights going to financial services company Allianz - the idea of a home named after a fast food giant may not sit too well with many in a city considered the birthplace of some of Italian's most famous and traditional cuisine. 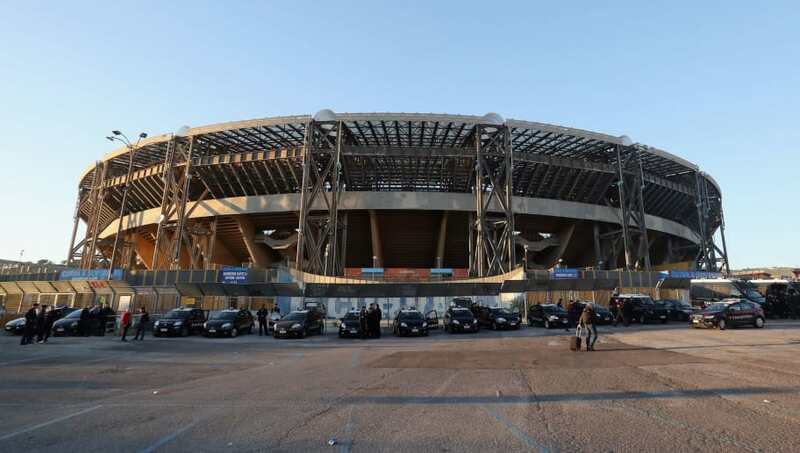 The Stadio San Paolo also remains an iconic venue for Napoli fans due to its role in the club's history, while the city council has previously unsuccessfully attempted to rename the stadium after club legend Diego Maradona.